This is a brand new product for me, and will be a series of about ten myths and activities. Each one for the low price of $3.50! Students need to know the ancient myths because the great wisdom of humanity is contained in those stories. Myth Comics: Icarus gives teachers three days’ worth of activities to do with the myth. Even if you AREN’T interested in incorporating this into a mythology unit, this bundle can stand alone as a way to build critical writing, reading, and viewing skills and are an excellent preparation for state tests which tend to include activities where you read a myth and read modern interpretations of it. And the witnesses ran off to a gang war. Where he rented a house and tended the garden. What was he doing aging in a suburb? To the middling stature of the merely talented? Fails every time and hates himself for trying. And wishes he had drowned. I’ve always likes this painting. It’s a great supplement to the Icarus myth, and a great lesson in composition. The title is The Fall of Icarus, which would make you think that Icarus would be the most prominent image in the composition. But he isn’t. In fact, you have to look around a little bit to find him. 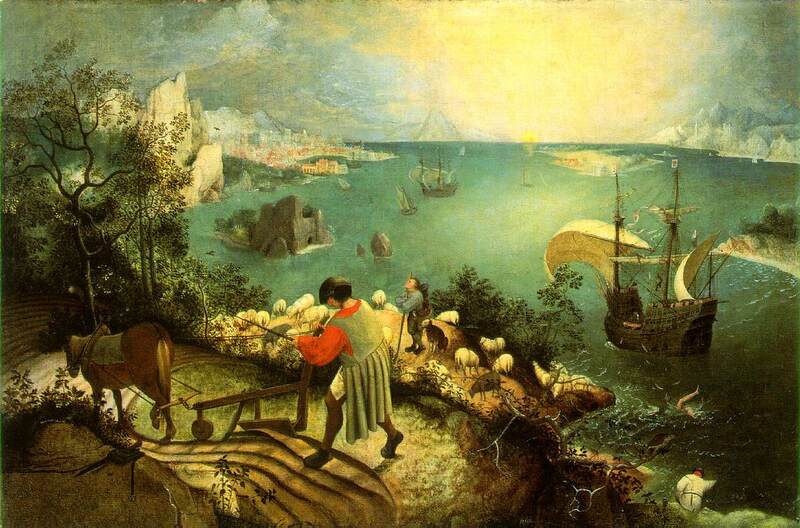 The most prominent figure in the painting is the farmer plowing, followed by the ship. So what’s going on here? Icarus’s fatal flaw is said to be hubris, or excessive pride or self confidence. He was too cocky, so he flew too close to the sun, his wings melted, and he fell into the water and drowned. Game over. But this painting teaches us a great lesson for when we get a little too big for a britches and think that we are more important than we actually are. Icarus is too self-centered for his own good, and probably believed that the sun revolved around him (in pre-Galilean days, not as far fetched as you might think.) But in reality, our lives matter very little to most people. The farmer never looks up, the ship probably never stops, and life goes on even though Icarus’s doesn’t. It’s a lesson that plenty of self-centered people need to learn – we probably wouldn’t think overly highly of ourselves if we realize how insignificant we are in the grand scheme of things. The Greeks new this, which is we they had their gods.